PARIS --- The average unit cost of Lockheed Martin F-35 fighters in the ninth Low-Rate Initial Production Lot 9 (LRIP 9) is $206.3 million, according to our analysis of all 46 contracts that have been made public for Lot 9. This is just $16.7 million (or 7%) lower than the average cost of the Lot 5 aircraft ordered in 2012 – fully five years ago. Separately, a direct comparison of Lot 5 and Lot 9 aircraft costs released by the F-35 Joint Program Office (JPO) shows that the cost of a “generic” F-35 has actually increased by $7.63 million over the same five years, 2012 to 2017. The “generic” F-35 is a notional aircraft used to compare unit costs from year to year; it is the average cost of one aircraft of each of the three versions (F-35A CTOL, F-35B STOVL and F-35C CV) in the same production lot. JPO’s figures show that, of the three variants, only the F-35A saw its cost decline, by a modest $3 million over those five years. The cost of both other variants increased substantially (see Table 2). JPO only compares airframe costs, and for reasons it has not explained excludes engine and other costs. Both our detailed analysis of Lot 9 contracts, and the JPO’s own figures, contradict many public statements by Lockheed Martin and the F-35 Joint Program Office (JPO) claiming that unit costs are dropping with each successive LRIP lot, and that by 2019 the unit cost of an F-35A will have dropped to $85 million. This now looks more implausible than ever. Furthermore, the JPO continues to award contracts for Lot 9, so it is likely the unit cost of Lot 9 aircraft will continue to grow. Four Lot 9 contracts have been awarded so far this year. What all this shows is that neither Lockheed Martin nor the Joint Program Office have a real handle on their public statements about aircraft unit costs, which cannot be independently substantiated. Our detailed analysis of all publicly-released Pentagon contracts shows that each Lot 9 airframe costs on average $153.9 million, and that each Pratt & Whitney F135 engine costs $23.03 million, which adds up to $177.02 million for a complete aircraft. Upgrades and retrofits account, on average, for an additional $32.07 million per aircraft, bringing the average cost of each generic Lot 9 aircraft to $206.3 million. We identified Lot 9 contracts either because they were so labeled, or because they carried a Lot 9 contract reference. These costs were calculated by adding all Lot 9 contracts awarded by the Pentagon, and dividing their total value by the number of Lot 9 aircraft (57) and engines (63, or 57 + 6 spares). They include the cost of fixes, modifications and other post-delivery costs that are not specifically attributed to Lot 9, but which were awarded since September 2014 under a Lot 9 secondary contract reference (N00019-14-G-0020). We have ignored any statements by Lockheed Martin and Pratt & Whitney which have not been confirmed by Pentagon contract awards. We have also ignored the Nov. 2 announcement by the Joint Program Office of a $6.1 billion contract for Lot 9 aircraft as it has still not been confirmed by the Pentagon, and does not include the cost of engines. Even using the JPO’s own figures, F-35 unit costs are continuing to grow. It should again be noted that the figures provided by JPO do not include the cost of the engine nor the upgrades and retrofits needed to meet contract performance standards. -- $125 million for each of seven F-35C CV aircraft for the US Navy. Consequently, each F-35s ordered in Lot 5 costs $114.33 million on average. So, according to JPO’s ow figures, over the past five years (2012-2017) the average cost of an F-35 has actually increased, from $114.33 million for Lot 5 aircraft to $121.96 million in Lot 9 (+ 7%), instead of dropping, as JPO officials like to claim. III. Is JPO muddying the waters on purpose? For example, using the unit costs above, the total cost of Lot 9 –- which comprises 42 F-35As, 13 F-35Bs and two F-35Cs -- should be $6.203.4 billion, and not $6.1 billion as JPO announced in November. It is also worth noting that JPO has begun to award contracts covering work on two or more LRIP lots, and has also announced “handshake” contracts that are not followed up by a properly formatted – and Congressionally-mandated – contract announcement. There is no obvious reason for switching from the previous lot-by-lot contract award, except to make it impossible for outside observers to tally the cost of each lot, and thus work out the average unit cost of the aircraft by lot. It certainly looks, in the absence of a more plausible explanation, as if the JPO is actually trying to muddy up the waters. As the above table illustrates, the cost of the “A” variant dropped marginally in 5 years, by just $3 million, while the cost of the two other variants increased substantially, by as much as $18.6 million for the most expensive F-35B STOVL variant. If the $23.03 million cost of a generic engine is added, the average cost of a generic F-35 from Lot 9 increases to $144.99 million by the JPO's own reckoning. Again, this disproves claims that F-35 costs are dropping with each successive production lot. We asked JPO chief spokesman Joe DellaVedova for an explanation on May 20, but have received no response by the time this story was posted on May 30. 3.) 22 contracts awarded to Lockheed Martin for Lot 9 upgrade and retrofit required to bring the aircraft to required performance levels. - Upgrade costs per aircraft: $29,336,474 per aircraft. -- Total cost for each Lot 9 aircraft is: $206,280,347. Below are the all 46 contracts awarded for the F-35 Lot 9 that have been made public to date. They are the basis for our analysis of Lot 9 unit costs. Clicking on a link opens the corresponding page in the Pentagon Contracts database. -- one F-35B STOVL aircraft for the government of Italy. Work will be performed in Fort Worth, Texas, and is expected to be completed in May 2015. Fiscal 2014 aircraft procurement, Air Force, Marine Corps, Navy funds and international partner funds in the amount of $698,032,384 are being obligated on this award, none of which will expire at the end of the current fiscal year. This contract was not competitively procured pursuant to 10 U.S.C. 2304(c)(1). The Naval Air Systems Command, Patuxent River, Md., is the contracting activity (N00019-14-C-0002). Lockheed Martin Corp., Fort Worth, Texas, is being awarded a $60,000,000 modification to the previously awarded Lot IX F-35 Lightening II Joint Strike Fighter advance acquisition contract (N00019-14-C-0002) to procure long lead parts, materials and components in support of the procurement of four additional F-35A Air Systems for the government of Japan under the Foreign Military Sales program. Work will be performed in Fort Worth, Texas, and is expected to be completed in February 2015. Foreign military sales funds in the amount of $60,000,000 are being obligated on this award, none of which will expire at the end of the current fiscal year. The Naval Air Systems Command, Patuxent River, Maryland, is the contracting activity. Lockheed Martin Corp., Lockheed Martin Aeronautics Co., Fort Worth, Texas, is being awarded not-to-exceed $237,765,479 for delivery order 0031 against a previously issued basic ordering agreement (N00019-14-G-0020) for initial spares in support of low-rate initial production Lot 9 F-35 Lightning II aircraft for the Air Force, Navy, non-U.S. Department of Defense (DoD) participants and Foreign Military Sales customers. Spares to be procured include F-35 common spares; F-35A, B, and C variant unique spares; and aloft spares packages and deployment spare packages. Work will be performed in Fort Worth, Texas (13 percent); Owego, New York (11 percent); Torrance, California (11 percent); El Segundo, California (7 percent); Baltimore, Maryland (7 percent); Orlando, Florida (7 percent); Nashua, New Hampshire (6 percent); San Diego, California (6 percent); Samlesbury, United Kingdom (5 percent); North Amityville, New York (5 percent); Cheltenham, United Kingdom (5 percent); Cedar Rapids, Iowa (5 percent); Alpharettta, Georgia (3 percent); East Aurora, New York (3 percent); Windsor Locks, Connecticut (3 percent); and Irvine, California (3 percent), and is expected to be completed in June 2017. Fiscal 2013 aircraft procurement (Air Force); fiscal 2015 aircraft procurement (Navy and Air Force); non-U.S. DoD participant funding; and foreign military sales funds in the amount of $233,890,119 are being obligated at time of award, $26,156,042 of which will expire at the end of the current fiscal year. This order combines purchases for the Air Force ($96,018,388; 41 percent); Navy ($33,308,517; 14 percent); non-U.S. DoD participants ($85,991,983; 37 percent); and Foreign Military Sales customers ($18,571,231; 8 percent). The Naval Air Systems Command, Patuxent River, Maryland, is the contracting activity. Lockheed Martin Corp., Fort Worth, Texas, is being awarded a $101,304,341 modification to the previously awarded Lot IX F-35 Lightening II Joint Strike Fighter advance acquisition contract (N00019-14-C-0002) for the procurement of helmet mounted display systems (HMDS) (383) for the Air Force, Marine Corps, Navy; international partners; and the governments of Japan and Israel under the Foreign Military Sales program. The HMDS is a bi-ocular helmet display system that provides the pilot with aircraft/mission data on the visor display. Data consists of flight, navigation, and weapons symbology and video from onboard sensors. Work will be performed in Cedar Rapids, Iowa (65 percent); and Fort Worth, Texas (35 percent), and is expected to be completed in June 2018. Fiscal 2013 aircraft procurement (Air Force); 2014 aircraft procurement (Navy, Marine Corps); and 2015 aircraft procurement (Navy, Marine Corps, and Air Force); international partner, and foreign military sales funds in the amount of $101,304,341 are being obligated on this award, $23,397,200 of which will expire at the end of the current fiscal year. This modification combines purchase for the Air Force ($47,086,535; 46.5 percent); Marine Corps ($22,726,422; 22.4 percent); Navy ($15,088,165; 14.9 percent); international partners ($12,166,674; 12 percent); and the governments of Japan ($437,030; 0.45 percent) and Israel ($3,799,515; 3.75 percent) under the Foreign Military Sales program. The Naval Air Systems Command, Patuxent River, Maryland is the contracting activity. Lockheed Martin Corp., Lockheed Martin Aeronautics Co., Fort Worth, Texas, is being awarded a $431,322,997 modification to the previously awarded Lot IX F-35 Lightening II Joint Strike Fighter advance acquisition contract (N00019-14-C-0002) for the procurement of production non-recurring items. These items include special tooling and special test equipment items that are critical to meeting current and future production rates for the Air Force, Navy, Marine Corps; non-U.S. Department of Defense participants; and foreign military sales customers. Work will be performed in Fort Worth, Texas (35 percent); Palmdale, California (10 percent); Nashua, New Hampshire (8 percent); Preston, United Kingdom (7 percent); San Diego, California (5 percent); Orlando, Florida (4 percent); Marietta, Georgia (4 percent); Torino, Italy (4 percent); Merrimack, New Hampshire (4 percent); Eagan, Minnesota (4 percent); Hauppauge, New York (2 percent); Baltimore, Maryland (2 percent); Alpharetta, Georgia (2 percent); Rolling Meadows, Illinois (2 percent); Cheltenham, United Kingdom (2 percent); Grenaa, Denmark (1 percent); Hoogeveen, Netherlands (1 percent); Melbourne, Florida (1 percent); Salt Lake City, Utah (1 percent); and Garden Grove, California (1 percent), and is expected to be completed in December 2018. Fiscal 2015 aircraft procurement (Navy, Marine Corps, and Air Force), non-U.S. Department of Defense participant, and foreign military sales funds in the amount of $431,322,997 are being obligated on this award, none of which will expire at the end of the current fiscal year. This modification combines purchase for the Air Force ($150,136,184; 34.81 percent); Navy ($75,068,092; 17.40 percent); Marine Corps ($75,068,092; 17.40 percent); non-U.S. Department of Defense participants ($75,392,333; 17.48 percent); and foreign military sales customers ($55,658,296; 12.91 percent) under the Foreign Military Sales program. The Naval Air Systems Command, Patuxent River, Maryland, is the contracting activity. Lockheed Martin Corp., Lockheed Martin Aeronautics Co., Fort Worth, Texas, is being awarded a $430,878,490 cost-plus-incentive-fee, fixed-price-incentive-firm contract for non-air vehicle spares, support equipment, Autonomic Logistics Information System hardware and software upgrades, supply chain management, full mission simulators and non-recurring engineering services in support of low-rate initial production Lot 9 F-35 Lightning II Joint Strike Fighter aircraft for the Air Force, Marine Corps, Navy, non-Department of Defense participants, and foreign military sales (FMS) customers. Work will be performed in Orlando, Florida (70 percent); Fort Worth, Texas (17 percent); El Segundo, California (7 percent); Owego, New York (4 percent); Greenville, South Carolina (1 percent); and Samlesbury, United Kingdom (1 percent), and is expected to be completed in January 2022. Fiscal 2013 and 2014 aircraft procurement (Air Force, Marine Corps, and Navy); fiscal 2014 and 2015 other procurement (Navy); non-Department of Defense participants, and FMS funds in the amount of $430,878,490 will be obligated at time of award, $3,889,294 of which will expire at the end of the current fiscal year. This contract combines purchases for the Air Force ($136,308,496; 32 percent); Navy ($30,326,973; 7 percent); Marine Corps ($32,762,358; 8 percent); non-Department of Defense participants ($187,885,664; 44 percent); and FMS customers ($43,594,999; 10 percent) under the FMS program. This contract was not competitively procured pursuant to 10 U.S. Code 2304(c)(1). The Naval Air Systems Command, Patuxent River, Maryland, is the contracting activity (N00019-15-C-0114). Lockheed Martin Corp., Lockheed Martin Aeronautics Co., Fort Worth, Texas, is being awarded a $120,555,991 modification to the previously awarded low-rate initial production Lot IX F-35 Lightning II Joint Strike Fighter advance acquisition contract (N00019-14-C-0002) to procure the non-recurring engineering effort necessary to develop build-to-print packages by variant (F-35A, F-35B, F-35C), to provide Group A and Group A enabler provisions to support future Band 2/5 capabilities of the F-35 Joint Strike Fighter. Work will be performed in Fort Worth, Texas, and is expected to be completed in June 2018. Fiscal 2015 research, development, test and evaluation (Air Force); fiscal 2016 research, development, test and evaluation (Air Force and Marine Corps); and non-U.S. Department of Defense participants funds in the amount of $36, 287,605 are being obligated on this award, $9,190,887 of which will expire at the end of the current fiscal year. The Naval Air Systems Command, Patuxent River, Maryland, is the contracting activity. Lockheed Martin Corp., Lockheed Martin Aeronautics Co., Fort Worth, Texas, is being awarded a $64,500,000 modification to a previously awarded advanced acquisition contract (N00019-15-C-0003) for long lead materials and efforts associated with the production of the low-rate initial production 11 Japanese F-35A air systems for the government of Japan under the Foreign Military Sales program. Work will be performed in Fort Worth, Texas, and is expected to be completed in February 2016. Foreign military sales funds in the amount of $64,500,000 are being obligated on this award, none of which will expire at the end of the current fiscal year. The Naval Air Systems Command, Patuxent River, Maryland is the contracting activity. Lockheed Martin Corp., Lockheed Martin Aeronautics Co., Fort Worth, Texas, is being awarded an undefinitized contractual action not-to-exceed $5,370,955,495 to the previously awarded low-rate initial production Lot IX F-35 Lightning II Joint Strike Fighter advance acquisition contract (N00019-14-C-0002). This modification provides for the procurement of 41 F-35A aircraft, including 26 F-35As for the Air Force; six F-35As for Norway; seven F-35As for Israel; two F-35As for Japan; 12 F-35Bs, including six for the Marine Corps and six for the British Royal Navy; and two F-35Cs for the Navy. Work will be performed in Fort Worth, Texas (30 percent); El Segundo, California (25 percent); Warton, United Kingdom (20 percent); Orlando, Florida (10 percent); Nashua, New Hampshire (5 percent); Nagoya, Japan (5 percent); and Baltimore, Maryland (5 percent), and is expected to be completed in December 2017. Fiscal 2016 aircraft procurement (Air Force, Marine Corps, and Navy); and non-U.S. Department of Defense participants and foreign military sales funds in the amount of $625,099,999, are being obligated on this award, none of which will expire at the end of the current fiscal year. The Naval Air Systems Command, Patuxent River, Maryland, is the contracting activity. Lockheed Martin Corp., Lockheed Martin Aeronautics Co., Fort Worth, Texas, is being awarded an undefinitized contract action with a firm-fixed-price, not-to-exceed $181,765,203 modification to a previously awarded advance acquisition contract (N00019-14-C-0002). This modification provides for the manufacture and delivery of F-35 low-rate initial production Lot 9 Alternate Mission Equipment, including armaments, pilot flight equipment, and red gear for the Air Force, Marine Corps, Navy, non-U.S. Department of Defense (DoD) participants, and for the governments of Israel and Japan under the Foreign Military Sales program. Work will be performed in Fort Worth, Texas, and is expected to be completed in September 2019. Fiscal 2015 aircraft procurement (Air Force); fiscal 2016 aircraft procurement (Marine Corps, and Navy); non-U.S. DoD participants; and foreign military sales funds in the amount of $181,765,203 are being obligated on this award, none of which will expire at the end of the current fiscal year. This contract combines purchase for the Air Force ($66,076,555; 48.46 percent); Marine Corps ($19,039,454; 13.97 percent); Navy ($6,923,078; 5.08 percent); non-U.S. DoD participants ($30,088,244, 22.07 percent); and the governments of Japan ($2,617,276; 1.92 percent); and Israel ($11,518,219, 8.5 percent). The Naval Air Systems Command, Patuxent River, Maryland, is the contracting activity. Lockheed Martin Corp., Lockheed Martin Aeronautics Co., Fort Worth, Texas, is being awarded a not-to-exceed $26,450,000 modification to firm-fixed-price delivery order 0031 against a previously issued basic ordering agreement (N00019-14-G-0020). This modification provides for low-rate initial production Lot 9 air vehicle initial spares to include F-35B aloft spares packages required to support the air vehicle delivery schedule for the Marine Corps. Work will be performed in Fort Worth, Texas (24.4 percent); El Segundo, California (9 percent); Owego, New York (8.6 percent); Samlesbury, United Kingdom (7.2 percent); Cheltenham, United Kingdom (6.2 percent); Nashua, New Hampshire (5.8 percent); Torrance, California (5.5 percent); Orlando, Florida (4.9 percent); Cedar Rapids, Iowa (3.7 percent); San Diego, California (3.6 percent); Phoenix, Arizona (3.1 percent); Melbourne, Florida (3.0 percent); Irvine, California (2.5 percent); North Amityville, New York (2.4 percent); Windsor Locks, Connecticut (2.2 percent); Baltimore, Maryland (2.2 percent); Papendrect, Netherlands (1.9 percent); Rolling Meadows, Illinois (1.8 percent); and Alpharetta, Georgia (1.8 percent), and is expected to be completed in March 2020. Fiscal 2016 aircraft procurement (Navy/Marine Corps) funds in the amount of $26,450,000 will be obligated at time of award, none of which will expire at the end of the current fiscal year. The Naval Air Systems Command, Patuxent River, Maryland, is the contracting activity. Lockheed Martin Corp., Lockheed Martin Aeronautics Co., Fort Worth, Texas, is being awarded a not-to-exceed $16,497,297 modification to delivery order 0031 previously placed against basic ordering agreement N00019-14-G-0020. This modification provides for deployable spares packages in support of the low-rate initial production Lot 9 F-35B aircraft for the Marine Corps. Work will be performed in Fort Worth, Texas (24.4 percent); El Segundo, California (9 percent); Owego, New York (8.6 percent); Samlesbury, United Kingdom (7.2 percent); Cheltenham, United Kingdom (6.2 percent); Nashua, New Hampshire (5.8 percent); Torrance, California (5.5 percent); Orlando, Florida (4.9 percent); Cedar Rapids, Iowa (3.7 percent); San Diego, California (3.6 percent); Phoenix, Arizona (3.1 percent); Melbourne, Florida (3 percent); Irvine, California (2.5 percent); North Amityville, New York (2.4 percent); Windsor Locks, Connecticut (2.2 percent); Baltimore, Maryland (2.2 percent); Papendrect, Netherlands (1.9 percent); Rolling Meadows, Illinois (1.8 percent); and Alpharetta, Georgia (1.8 percent), and is expected to be completed in July 2020. Fiscal 2016 aircraft procurement (Navy/Marine Corps) funds in the amount of $16,497,297 will be obligated at time of award, none of which will expire at the end of the current fiscal year. The Naval Air Systems Command, Patuxent River, Maryland, is the contracting activity. Lockheed Martin Corp., Lockheed Martin Aeronautics Co., Fort Worth, Texas, is being awarded a $743,169,377 fixed-price-incentive, firm target and cost-plus-fixed-fee modification to the previously awarded low-rate initial production Lot 9 F-35 Lightening II Joint Strike Fighter advance acquisition contract (N00019-14-C-0002). This modification provides additional funding and will establish not-to-exceed (NTE) prices for diminishing manufacturing and material shortages redesign and development, estimated post production concurrency changes and country unique requirements. In addition, this modification will establish NTE prices for one F-35A aircraft and one F-35B aircraft for a non-U.S. Department of Defense (DoD) participant in the F-35 program. Work will be performed in Fort Worth, Texas (30 percent); El Segundo, California (25 percent); Warton, United Kingdom (20 percent); Orlando, Florida (10 percent); Nashua, New Hampshire (5 percent); Nagoya, Japan (5 percent); and Baltimore, Maryland (5 percent), and is expected to be completed in December 2019. Fiscal 2015 aircraft procurement (Air Force, Marine Corps, and Navy); and non-U.S. DoD participant and foreign military sales funds in the amount of $506,092,785 are being obligated on this award; $270,676,332 of which will expire at the end of the current fiscal year. This modification combines purchases for the Air Force $207,389,821 (27.9 percent), Navy $85,533,666 (11.5 percent), and Marine Corps $91,923,008 (12.4 percent), non-U.S. DoD participants $332,940,791 (44.8 percent); and Foreign Military Sales $25,382,091 (3.4 percent). The Naval Air Systems Command, Patuxent River, Maryland, is the contracting activity. Lockheed Martin Corp., Lockheed Martin Aeronautics Co., Fort Worth, Texas, is being awarded a $9,533,512 not-to-exceed, undefinitized modification to a previously awarded low-rate initial production Lot 9 F-35 Lightening II Joint Strike Fighter advanced acquisition contract (N00019-14-C-0002). This modification provides for the delivery of hardware and engineering services for the government of Japan. Work will be performed in Baltimore, Maryland (80 percent); and Nagoya, Japan (20 percent), and is expected to be completed in October 2018. Foreign military sales funds in the amount of $6,812,978 are being obligated on this award, none of which will expire at the end of the current fiscal year. The Naval Air Systems Command, Patuxent River, Maryland, is the contracting activity. Lockheed Martin Corp., Lockheed Martin Aeronautics Co., Fort Worth, Texas, is being awarded a $10,392,093 modification to a previously awarded cost-plus-incentive fee contract (N00019-14-C-0002) to provide additional funding for affordability-based cost reduction initiatives in support of low-rate initial production Lot 9 F-35 Lightening II Joint Strike Fighter. Work will be performed in Fort Worth, Texas (30 percent); El Segundo, California (25 percent); Warton, United Kingdom (20 percent); Orlando, Florida (10 percent); Nashua, New Hampshire (5 percent); Nagoya, Japan (5 percent); and Baltimore, Maryland (5 percent), and is expected to be completed in March 2020. Fiscal 2015 aircraft procurement (Air Force, Marine Corps, and Navy) funds in the amount of $10,392,093 are being obligated on this award, all of which will expire at the end of the current fiscal year. The Naval Air Systems Command, Patuxent River, Maryland, is the contracting activity. United Technologies Corp., Pratt & Whitney Military Engines, East Hartford, Connecticut, is being awarded $38,459,410 for modification P00010 to a previously awarded cost-plus-incentive-fee, fixed-price-incentive-firm-target contract (N00019-14-C-0004) for sustainment program administrative labor in support of the F-35 Lightning II low-rate initial production Lot IX procurement. This modification provides for program administrative labor in support of F-135 sustainment efforts. Work will be performed in East Hartford, Connecticut (85 percent); and Indianapolis, Indiana (15 percent), and is expected to be completed in June 2019. This contract combines purchases for the Air Force ($14,547,501; 38 percent); international partners ($10,169,461; 26 percent); Navy/Marine Corps ($8,027,357; 21 percent); and foreign military sales (FMS) customers ($5,715,091; 15 percent). Fiscal 2014 aircraft procurement (Air Force, Navy); international partner; and FMS funds in the amount of $38,459,410 will be obligated at time of award, $22,574,858 of which will expire at the end of the current fiscal year. The Naval Air Systems Command, Patuxent River, Maryland, is the contracting activity. United Technologies Corp., Pratt & Whitney Military Engines, East Hartford, Connecticut, is being awarded $11,418,713 for modification P00016 to a previously awarded firm-fixed-price, fixed-price-incentive-firm, cost-plus-incentive-fee contract (N00019-14-C-0026). This modification exercises an option for the supplies and services to implement engineering changes to the Rolls Royce lift fan systems and engine ice protection system in support of the F-35 Lightening II for the Marine Corps, Navy, Air Force and international partners. Work will be performed at Indianapolis, Indiana (97 percent); and Oklahoma City, Oklahoma (3 percent), and is expected to be completed in December 2017. Fiscal 2015 aircraft procurement (Marine Corps, Air Force); fiscal 2016 aircraft procurement (Navy); and international partner funds in the amount of $11,418,713 will be obligated at the time of award, none of which will expire at the end of the current fiscal year. This modification combines purchases for the Marine Corps ($11,112,955; 97.32 percent); Navy ($85,505; 0.75 percent); Air Force ($70,363; 0.62 percent); and international partners ($149,890; 1.31 percent). The Naval Air Systems Command, Patuxent River, Maryland, is the contracting activity. 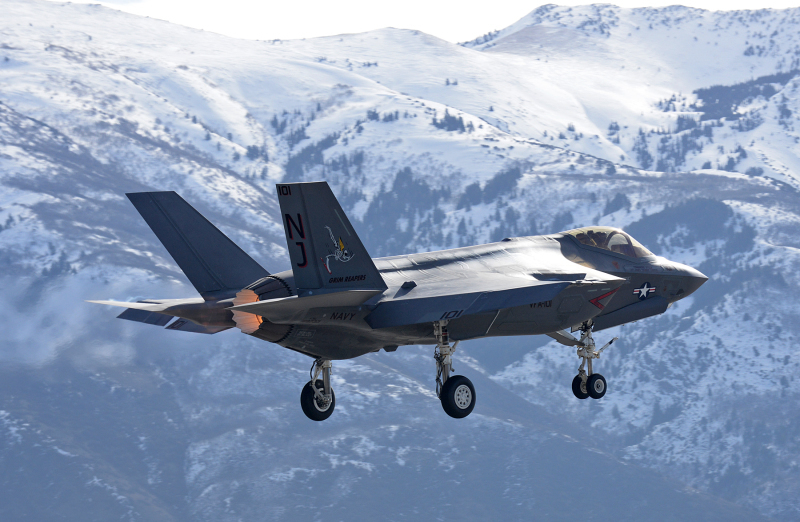 United Technologies Corp., Pratt & Whitney Military Engines, East Hartford, Connecticut, is being awarded a $1,038,074,689 modification to the previously awarded advance acquisition contract for the Lot IX low-rate initial production F-35 Lightning II Propulsion contract (N00019-14-C-0004) for the Air Force, Navy/Marine Corps, international partners and foreign military sales (FMS) customers. This modification provides for components, parts and materials associated with the procurement of 28 F135-PW-100 conventional take-off and landing propulsion systems for the Air Force; six F135-PW-600 propulsion systems for the Marine Corps; and four F135-PW-100 propulsion systems for the Navy. In addition, this modification provides for seven each F135-PW-100 and F135-PW-600 propulsion systems for international partners, as well as 11 F135-PW-100 spare propulsion systems for FMS customers. This modification further provides for three spare propulsion systems and one trainer propulsion system for the Air Force. This contract combines purchases for the Air Force ($365,456,442; 35 percent); the Navy/Marine Corps ($226,542,833; 22 percent); international partners ($299,525,306; 29 percent); and FMS customers ($146,550,108; 14 percent). Work will be performed in East Hartford, Connecticut (85 percent); Indianapolis, Indiana (11 percent); and Bristol, United Kingdom (4 percent), and is expected to be completed in September 2019. Fiscal 2014 and 2015 aircraft procurement (Navy and Air Force); international partner; and foreign military sales funds in the amount of $1,038,074,689 will be obligated at time of award, $14,479,576 of which will expire at the end of the current fiscal year. The Naval Air Systems Command, Patuxent River, Maryland, is the contracting activity. United Technologies Corp., Pratt & Whitney Military Engines, East Hartford, Connecticut, is being awarded a $9,020,915 modification to a previously awarded cost-plus-incentive fee, cost-plus-fixed-fee contract (N00019-14-C-0004) for F-35 Lightning II Propulsion System Low Rate Initial Production Lot 9 non-annualized sustainment in support of the international partners. Support to be provided includes equipment and depot activation services and supplies. Work will be performed in Hartford, Connecticut (88 percent) and Indianapolis, Indiana (12 percent), and is expected to be completed in September 2018. International Partner funds in the amount of $9,020,915 will be obligated at time of award, none of which will expire at the end of the current fiscal year. The Naval Air Systems Command, Patuxent River, Maryland is the contracting activity. United Technologies Corp., Pratt & Whitney, Military Engines, East Hartford, Connecticut, is being awarded a $104,290,158 modification to a previously awarded cost-plus-incentive, cost-plus-fixed-fee contract (N00019-14-C-0004) for low-rate initial production (LRIP) Lot IX non-annualized sustainment in support of the F-135 propulsions systems for the F-35 Lightning II Joint Strike Fighter aircraft for the Navy, Air Force, Marine Corps, non -U.S. Department of Defense (DoD) participants and foreign military sales customers. This effort includes support equipment and depot activation services and supplies for LRIP 9 propulsion systems. Work will be performed in East Hartford, Connecticut (88 percent); and Indianapolis, Indiana (12 percent), and is expected to be completed in September 2018. Fiscal 2014 and 2015 aircraft procurement (Air Force, Navy, Marine Corps); non-U.S. DoD participants and foreign military sales funds in the amount of $104,290,158 are being obligated on this award, $75,919,490 of which will expire at the end of the current fiscal year. This contract combines purchases for the Air Force ($31,983,441; 31 percent); the Navy ($32,686,616; 31 percent); the Marine Corps ($11,249,433; 11 percent); non-U.S. DoD participants ($26,797,856; 26 percent); and foreign military sales ($1,572,812; 1 percent) under the Foreign Military Sales program. The Naval Air Systems Command, Patuxent River, Maryland, is the contracting activity. United Technologies Corp., Pratt & Whitney, Military Engines, East Hartford, Connecticut, is being awarded a not-to-exceed $249,830,014 undefinitized modification to a previously awarded fixed-price-incentive, firm-target contract (N00019-14-C-0004) to procure low-rate initial production (LRIP) Lot 9 propulsion system initial spares for the global spares pool to include initial spare engines, initial spare modules, and initial spare parts required in support of the LRIP Lot 9 F-135 propulsions systems for the F-35 Lightning II Joint Strike Fighter aircraft for the Navy, Air Force, Marine Corps, international partners, and foreign military sales customers. Work will be performed in East Hartford, Connecticut (93 percent); Indianapolis, Indiana (6 percent); and Bristol, United Kingdom (1 percent). Work is expected to be completed in July 2018. Fiscal 2013 aircraft procurement (Navy); fiscal 2014 aircraft procurement (Air Force); fiscal 2015 aircraft procurement (Air Force and Navy); international partner; and foreign military sales funds in the amount of $237,915,769 are being obligated on this award, $67,202 of which will expire at the end of the current fiscal year. This contract combines purchases for the Air Force ($121,377,432; 49 percent); Navy ($57,573,977; 23 percent); international partners ($62,853,526; 25 percent); and foreign military sales ($8,025,079; 3 percent). The Naval Air Systems Command, Patuxent River, Maryland, is the contracting activity. Lockheed Martin Corp., Lockheed Martin Aeronautics Co., Fort Worth, Texas, is being awarded $7,085,000 for modification to a previously awarded cost-plus-fixed-fee delivery order 5500 issued against a previously issued Basic Ordering Agreement (N00019-14-G-0020). This modification authorizes two additional Engineering Change Proposals for air vehicle retrofit modifications to be incorporated into designated F-35 aircraft, and includes retrofit modification kits, installation, and labor. Work will be performed in Fort Worth, Texas (45 percent); Ogden, Utah (20 percent); Cherry Point, North Carolina (20 percent); Yuma, Arizona (5 percent); Eglin Air Force Base, Florida (5 percent); and Edwards Air Force Base, California (5 percent), and is expected to be completed in March 2018. Fiscal 2014 aircraft procurement (Marine Corps), 2015 aircraft procurement (Marine Corps and Air Force) and fiscal 2015 research, development, test and evaluation funds (Navy, Marine Corps, and Air Force) in the amount of $3,542,500 are being obligated on this award, none of which will expire at the end of the current fiscal year. The Naval Air Systems Command, Patuxent River, Maryland, is the contracting activity. Lockheed Martin Corp., Lockheed Martin Aeronautics Co., Fort Worth, Texas, is being awarded a not-to-exceed $16,492,000 undefinitized delivery order against a previously issued Basic Ordering Agreement (N00019-14-G-0020) for the procurement and installation of vehicle management computer retrofit modification kits into designated aircraft that are critical to meeting F-35 Lightning II requirements. Work will be performed in Fort Worth, Texas (45 percent); Ogden, Utah (20 percent); Cherry Point, North Carolina (20 percent); Yuma, Arizona (5 percent); Eglin Air Force Base, Florida (5 percent); and Edwards Air Force Base, California (5 percent), and is expected to be completed in August 2016. Fiscal 2013 and 2015 aircraft procurement (Navy, Marine Corps and Air Force), fiscal 2015 research, development, test and evaluation funds (Navy, Marine Corps and Air Force) and International Partner funds in the amount of $8,246,000 are being obligated on this award, $4,051,934 of which will expire at the end of the current fiscal year. The Naval Air Systems Command, Patuxent River, Maryland, is the contracting activity. Lockheed Martin Corp., Lockheed Martin Aeronautics Co., Fort Worth, Texas, is being awarded a not-to-exceed $37,538,800 undefinitized contract action modification for a delivery order (5507) against a previously issued basic ordering agreement (N00019-14-G-0020). This modification authorizes engineering change proposals for air vehicle retrofit modifications to be incorporated into designated aircraft and supporting subsystems in support of the F-35 aircraft Block 3F requirements. This modification also includes retrofit modification kits, installation, and labor to incorporate the modification kits. Work will be performed in Fort Worth, Texas (90 percent); Marietta, Georgia (9 percent); and Palmdale, California (1 percent), and is expected to be completed in August 2018. Fiscal 2014 and 2015 aircraft procurement and research, development, test and evaluation (Navy, Marine Corps, and Air Force) funds in the amount of $13,093,580 are being obligated on this award, none of which will expire at the end of the current fiscal year. The Naval Air Systems Command, Patuxent River, Maryland, is the contracting activity. Lockheed Martin Corp., Lockheed Martin Aeronautics Co., Fort Worth, Texas, is being awarded a not-to-exceed $311,399,980 contract for undefinitized delivery order 5503 against a previously issued basic ordering agreement (N00019-14-G-0020) for the F-35 Lighting II Block 3F upgrade for the Air Force, Marine Corps, Navy, and the government of the United Kingdom. This order procures retrofit modification hardware necessary for the Block 3F upgrades, as well as engineering tasks supporting modification kit installation. Work will be performed in Fort Worth, Texas (90 percent); and Baltimore, Maryland (10 percent), and is expected to be completed in September 2021. Fiscal 2014 aircraft procurement (Marine Corps, and Air Force); fiscal 2015 aircraft procurement (Navy, Marine Corps, and Air Force); fiscal 2015 research, development, test and evaluation (Navy, Marine Corps, and Air Force); and Joint Strike Fighter Partner funds in the amount of $84,064,987 are being obligated on this award, none of which will expire at the end of the current fiscal year. This contract combines purchase for the Air Force ($142,699,986; 46 percent); Marine Corps ($86,199,996; 27 percent); Navy ($61,000,000; 20 percent); and the government of the United Kingdom $21,499,998; 7 percent). The Naval Air Systems Command, Patuxent River, Maryland, is the contracting activity. Lockheed Martin Corp., Lockheed Martin Aeronautics Co., Fort Worth, Texas, is being awarded a $28,842,000 not-to-exceed, cost-plus-fixed-fee delivery order against a previously issued basic ordering agreement (N00019-14-G-0020). This delivery order provides for air vehicle retrofit modifications associated with the F-35A fuel tank overpressure engineering change proposal in support of the Air Force, and the governments of Australia, Italy, the Netherlands, and Norway. Work will be performed in Fort Worth, Texas (62 percent); Ogden, Utah (28 percent); and Palmdale, California (10 percent), and is expected to be completed in March 2017. Fiscal 2014 and 2015 aircraft procurement (Air Force); 2016 research, development, test and evaluation (Air Force); and international partner funds in the amount of $14,421,000 will be obligated at time of award, $6,656,033 of which will expire at the end of the current fiscal year. This contract combines purchases of the Air Force ($26,855,466; 93.11 percent); and the governments of Netherlands ($1,633,244; 5.67 percent); Italy ($201,880; 0.70 percent); Norway ($100,940; 0.35 percent) and Australia ($50,470; 0.17 percent). The Naval Air Systems Command, Patuxent River, Maryland, is the contracting activity. Lockheed Martin Corp., Lockheed Martin Aeronautics Co., Fort Worth, Texas, is being awarded $9,020,798 not-to-exceed modification to previously issued delivery order 5507 placed against basic ordering agreement N00019-14-G-0020. This modification provides for the procurement and installation of additional air vehicle retrofit kits supporting F-35 Block 3F and Navy initial operational capability-related engineering change proposals. Work will be performed in Fort Worth, Texas (85 percent); Ogden, Utah (13 percent); Marietta, Georgia (1 percent); and Palmdale, California (1 percent), and is expected to be completed in August 2018. Fiscal 2015 aircraft procurement (Navy); and fiscal 2016 research, development, test and evaluation (Navy) funds in the amount of $4,510,399 are being obligated on this award, none of which will expire at the end of the current fiscal year. The Naval Air Systems Command, Patuxent River, Maryland, is the contracting activity. Lockheed Martin Corp., Lockheed Martin Aeronautics Co., Fort Worth, Texas, is being awarded a $10,559,065 modification to exercise an option on delivery order (5500) that was previously issued against basic ordering agreement N00019-14-G-0020. This option procures 61 retrofit kits to correct deficiencies that preclude aircraft mission readiness in support of the Marine F-35 Strike Fighter aircraft initial operating capabilities. Work will be performed in Fort Worth, Texas (45 percent); Ogden, Utah (20 percent); Cherry Point, North Carolina (20 percent); Yuma, Arizona (5 percent); Eglin Air Force Base (AFB), Florida (5 percent); and Edwards AFB, California (5 percent), and is expected to be completed in January 2019. Fiscal 2015 aircraft procurement (Air Force, Marine Corps, Navy); and 2016 aircraft procurement (Air Force, Navy) funds in the amount of $10,559,065 will be obligated at time of award, none of which will expire at the end of the current fiscal year. This contract combines purchases of the Air Force ($6,251,922; 59.2 percent); Marine Corps ($2,336,937; 22.1 percent), and Navy ($1,970,206; 18.7 percent). The Naval Air Systems Command, Patuxent River, Maryland, is the contracting activity. Lockheed Martin Corp., Lockheed Martin Aeronautics Co., Fort Worth, Texas, is being awarded a $10,209,050 modification to delivery order 5503 previously issued against basic ordering agreement N00019-14-G-0020. This modification provides for the procurement of retrofit modification hardware and diminishing manufacturing source components required for F-35 Block 3F upgrades. Work will be performed in Fort Worth, Texas (90 percent); and Baltimore, Maryland (10 percent), and is expected to be completed in December 2020. Fiscal 2014 and 2015 aircraft procurement (Marine Corps, Air Force, Navy); fiscal 2016 research, development, test and evaluation (Air Force and Marine Corps); and international partner funds in the amount of $5,104,526 will be obligated at time of award, $956,701 of which will expire at the end of the current fiscal year. This contract combines purchases of the Marine Corps ($4,760,145; 47 percent); Air Force ($1,832,552; 18 percent); Navy ($608,067; 6 percent); and international partners ($3,008,287; 29 percent). The Naval Air Systems Command, Patuxent River, Maryland, is the contracting activity. Lockheed Martin Corp., Lockheed Martin Aeronautics Co., Fort Worth, Texas, is being awarded $27,189,434 for cost-plus-incentive-fee delivery order 0086 against a previously issued basic ordering agreement (N00019-14-G-0020). This delivery order provides for the non-recurring effort required to develop a Common F-35A air system, which includes training device integration, fusion updates and flight test requirements for the governments of Korea and Israel. Work will be performed in Fort Worth, Texas, and is expected to be completed in December 2018. International partner funding in the amount of $9,400,000 will be obligated at time of award, none of which will expire at the end of the current fiscal year. The Naval Air Systems Command, Patuxent River, Maryland, is the contracting activity. Lockheed Martin Corp., Lockheed Martin Aeronautics Co., Fort Worth, Texas, is being awarded $101,970,569 for cost-plus-incentive-fee delivery order 0026 against a previously issued basic ordering agreement (N00019-14-G-0020). This order definitizes a previously awarded undefinitized contract action and provides for additional non-recurring effort and integration efforts required in support of the F-35 Reprogramming Center West. Efforts will include the production of F-35 software data loads for laboratory testing, planning for verification and validation (V&V) test, conduct technical support of the test, design, build, and delivery of V&V modification kits and mission data file generation tools for the Foreign Military Sales customers. Work will be performed in Fort Worth, Texas (53 percent); Orlando, Florida (25 percent); Nashua, New Hampshire (18 percent); El Segundo, California (2 percent); and San Diego, California (2 percent), and is expected to be completed in December 2018. Foreign military sales funds in the amount of $74,121,831 will be obligated at time of award, none of which will expire at the end of the current fiscal year. The Naval Air Systems Command, Patuxent River, Maryland, is the contracting activity. Lockheed Martin Corp., Lockheed Martin Aeronautics Co., Fort Worth, Texas, is being awarded a not-to-exceed $136,588,895 for firm-fixed-price delivery order 0001 against a previously issued basic ordering agreement (N00019-14-G-0020). This modification provides for low-rate initial production Lot 10 air vehicle initial spares to include F-35 common spares; F-35A, F-35B and F-35C unique spares; and aloft spares packages/deployment spares packages required to support the air vehicle delivery schedule for the Air Force, Navy and Marine Corps, as well as non-Department of Defense (DoD) participants and Foreign Military Sales customers. Work will be performed in Fort Worth, Texas (24.4 percent); El Segundo, California (9 percent); Owego, New York (8.6 percent); Samlesbury, United Kingdom (7.2 percent); Cheltenham, United Kingdom (6.2 percent); Nashua, New Hampshire (5.8 percent); Torrance, California (5.5 percent); Orlando, Florida (4.9 percent); Cedar Rapids, Iowa (3.7 percent); San Diego, California (3.6 percent); Phoenix, Arizona (3.1 percent); Melbourne, Florida (3 percent); Irvine, California (2.5 percent); North Amityville, New York (2.4 percent); Windsor Locks, Connecticut (2.2 percent); Baltimore, Maryland (2.2 percent); Papendrect, Netherlands (1.9 percent); Rolling Meadows, Illinois (1.8 percent); and Alpharetta, Georgia (1.8 percent), and is expected to be completed in December 2019. Fiscal 2016 aircraft procurement (Air Force, Navy, Marine Corps) funds in the amount of $89,299,340 will be obligated at time of award, none of which will expire at the end of the current fiscal year. This delivery order combines purchases for the Air Force ($52,280,750; 38.3 percent); Navy ($1,303,033; 1 percent); Marine Corps ($35,715,557; 26.1 percent); non-DoD participants ($27,755,423; 20.3 percent); and Foreign Military Sales ($19,534,133; 14.3 percent). The Naval Air Systems Command, Patuxent River, Maryland, is the contracting activity. Lockheed Martin Corp., Lockheed Martin Aeronautics Co., Fort Worth, Texas, is being awarded $37,249,243 for modification to delivery order 5503 previously placed against basic ordering agreement N00019-14-G-0020. This modification definitizes the order and provides for additional non-recurring engineering, airworthiness efforts, delta training, and off-board mission system hardware supporting the Block 3F upgrade for aircraft for the Air Force, Navy/Marine Corps, and F-35 international partners. Work will be performed in Fort Worth, Texas (41 percent); Nashua, New Hampshire (12 percent); Baltimore, Maryland (12 percent); San Diego, California (12 percent); Owego, New York (12 percent); Orlando, Florida (7 percent); and Evendale, Ohio (4 percent), and is expected to be completed in December 2020. Fiscal 2014 and 2015 aircraft procurement (Air Force/Navy/Marine Corps); fiscal 2016 aircraft procurement (Navy); and international partner funds in the amount of $37,249,243 will be obligated at time of award, $12,544,903 of which will expire at the end of the current fiscal year. The Naval Air Systems Command, Patuxent River, Maryland, is the contracting activity. Lockheed Martin Corp., Lockheed Martin Aeronautics Co., Fort Worth, Texas, is being awarded an $11,650,000 not-to-exceed, undefinitized contract action against a previously issued basic ordering agreement (N00019-14-G-0020). This order provides for initial operational test and evaluation configuration support efforts in support of the F-35 Joint Strike Fighter aircraft for the Air Force and Navy, and international partner countries. Work will be performed in Fort Worth, Texas (87 percent); Farnborough, Hampshire, England (6 percent); Orlando, Florida (5 percent); Redondo Beach, California (1 percent); and Greenville, South Carolina (1 percent). Work is expected to be completed in October 2018. Fiscal 2017 research, development, test and evaluation (Navy and Air Force); and international partners funds in the amount of $5,825,000 are being obligated on this award, none of which will expire at the end of the current fiscal year. This order combines purchases for the Navy ($5,169,232; 44.4 percent); Air Force ($3,692,308; 31.7 percent); and international partners ($2,788,460; 23.9 percent). The Naval Air Systems Command, Patuxent River, Maryland, is the contracting activity. Lockheed Martin Corp., Lockheed Martin Aeronautics Co., Fort Worth, Texas, is being awarded $64,686,522 for firm-fixed-priced delivery order N0001917F0108 against a previously issued basic ordering agreement (N00019-14-G-0020). This order procures work on the integrated core processor in order to alleviate diminishing manufacturing sources constraints projected under F-35 production Lot 15 for the Air Force ($25,864,260; 40 percent); the Navy ($12,932,129; 20 percent); the Marine Corps ($12,932,129; 20 percent); and international partners ($12,958,004; 20 percent). Work will be performed in Fort Worth, Texas, and is expected to be completed in March 2019. Fiscal 2017 research, development, test and evaluation (Air Force); fiscal 2016 research, development, test and evaluation (Navy, Marine Corps); and international partners funds in the amount of $29,000,000 are being obligated on this award, none of which will expire at the end of the current fiscal year. The Naval Air Systems Command, Patuxent River, Maryland, is the contracting activity. Lockheed Martin Corp., Lockheed Martin Aeronautics Co., Fort Worth, Texas, is being awarded $10,470,663 for delivery order 0011 against a previously awarded basic ordering agreement (N00019-14-G-0020) to complete a Selective Precision Effects At Range Capability 3 risk reduction and integration study of the F-35 air system for the government of the United Kingdom. Work will be performed in Fort Worth, Texas (75 percent); Orlando, Florida (10 percent); Lancashire, United Kingdom (10 percent); and Redondo Beach, California (5 percent), and is expected to be completed in March 2020. International partner funds in the amount of $10,470,663 will be obligated at time of award, none of which will expire at the end of the current fiscal year. The Naval Air Systems Command, Patuxent River, Maryland, is the contracting activity. Lockheed Martin Corp., Lockheed Martin Aeronautics Co., Fort Worth, Texas, is being awarded a not-to-exceed $581,798,359 firm-fixed-price delivery order (0132) against a previously issued basic ordering agreement (N00019-14-G-0020). This modification provides for air vehicle initial spares to include F-35 common spares; F-35A, F-35B and F-35C unique spares, and aloft spares packages/deployment spares packages and reprogramming lab spares required to support the air vehicle delivery schedule for the Air Force, Navy, Marine Corps, non-Department of Defense (DoD) participants, and foreign military sales customers. Work will be performed in Fort Worth, Texas (24.4 percent); El Segundo, California (9 percent); Owego, New York (8.6 percent); Samlesbury, United Kingdom (7.2 percent); Cheltenham, United Kingdom (6.2 percent); Nashua, New Hampshire (5.8 percent); Torrance, California (5.5 percent); Orlando, Florida (4.9 percent); Cedar Rapids, Iowa (3.7 percent); San Diego, California (3.6 percent); Phoenix, Arizona (3.1 percent); Melbourne, Florida (3 percent); Irvine, California (2.5 percent); North Amityville, New York (2.4 percent); Windsor Locks, Connecticut (2.2 percent); Baltimore, Maryland (2.2 percent); Papendrect, Netherlands (1.9 percent); Rolling Meadows, Illinois (1.8 percent); and Alpharetta, Georgia (1.8 percent), and is expected to be completed in April 2021. Fiscal 2015 aircraft procurement (Air Force, Navy, Marine Corps); fiscal 2016 aircraft procurement (Air Force); fiscal 2017 aircraft procurement (Air Force, Navy, Marine Corps) funds; non-DoD participant; and foreign military sales funding in the amount of $580,798,359 will be obligated at time of award, $63,290,612 of which will expire at the end of the current fiscal year. This delivery order combines purchases for the Air Force ($190,222,900; 32.7 percent); Navy ($28,465,807; 4.9 percent); Marine Corps ($117,959,015; 20.3 percent); non-DoD participants ($208,819,069; 35.9 percent); and foreign military sales ($36,331,568; 14.3 percent). The Naval Air Systems Command, Patuxent River, Maryland, is the contracting activity. Lockheed Martin Corp., Lockheed Martin Aeronautics Co., Fort Worth, Texas, is being awarded a $109,563,735 modification to cost-plus-fixed-fee delivery order 5503 issued previously against basic ordering agreement N00019-14-G-0020. This modification provides for the procurement of 567 modification kits for offboard system hardware and turnaround assets, and also recurring labor for the completion of hardware and software upgrades in support of the F-35 Lighting III Block 3F upgrade for Air Force ($62,663,062; 57.19 percent); Marine Corps ($43,453,490; 39.67 percent); Navy $3,060,885; 2.79 percent); and international partners ($386,297; 0.35 percent). Work will be performed in Fort Worth, Texas (41 percent); Nashua, New Hampshire (12 percent); Baltimore, Maryland (12 percent); San Diego, California (12 percent); Owego, New York (12 percent); Orlando, Florida (7 percent); and Evendale, Ohio (4 percent), and is expected to be completed in December 2021. Fiscal 2015 aircraft procurement (Air Force, Marine Corps); fiscal 2016 aircraft procurement (Marine Corps and Navy); fiscal 2017 research, development, test and evaluation (Air Force); and international partner funds in the amount of $109,563,735 are being obligated at time of award, $101,788,101 of which will expire at the end of the current fiscal year. The Naval Air Systems Command, Patuxent River, Maryland, is the contracting activity.